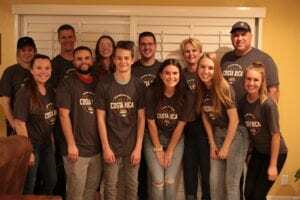 As many of you probably already know, the country of Costa Rica has a huge place in my heart and is a big part of what Kids On A Mission is involved in as an organization. For those of you who don’t know, KOAM has taken 2 teams to the city of Boca de Arenal the past two years and we have partnered with 2 churches each year, putting on a VBS for all of their kids. This is an opportunity that we are able to give kids of all ages where they get to have experiences that are much different than what they experience in the United States. Previous teams have experienced traveling to a new country, a new culture, and have been surrounded by people who don’t speak our language. For me, this is when my faith has grown the most. Mission trips are not just another stamp in your passport or the opportunity to get the perfect picture to post on your social media. They provide life changing opportunities where you get to see people come to know Jesus. Despite the cultural boundaries and language barrier, the love of Christ that we are sharing with these sweet Costa Ricans breaks every boundary and barrier that we might have. When our team is there, our actions have to speak louder than our words because of the simple reason that we speak different languages. But how amazing it is that God’s love can be spread and shared through the way that we act and how well we love?!? Kids On A Mission is excited to tell you that we are taking another team to Costa Rica at the end of this year! Our team of 12 is leaving on December 29th, 2018 and will return back to the US on January 9th, 2019. We are excited and eager to see the many things that God will do in and through us during our time in this country and how we will be able to bless others. We will be partnering with 3 different churches this year and are providing them with a fun and interactive Vacation Bible School for the children in their communities, sharing with them how much Jesus loves them. As our team is in the preparation process of our trip and trying to put all of our pieces together, please be praying for us as we get ready for this life-changing journey. We know that God is going to change the lives of so many in Costa Rica because of our team, but we also know that He is going to change our hearts even more through giving us the ability to spread His name to the nations. While our team is in Costa Rica we will be posting a blog daily, so if you would like to follow along with us, be on the lookout for those posts. Thank you all for your support!